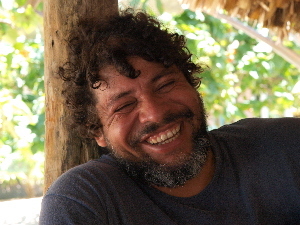 Joe, raised in the Belizean Jungle, takes delight in sharing his knowledge of local fauna and flora, medicinal plants and local rum-drinks with visitors. Miriam has been on the farm for more than fourteen years and adds the feminine touch to the adventure accommodations, serving generous portions of fire-cooked, home-style meals of creatively combined local ingredients and spices. Oh it is nice to be back in Belize. oh it is lovely here in Belize. oh and the air, no it’s not fair, for it is barely there. Now that I am here, everything is clear. Now I can see this is where I want to be. animals and birds in the trees. This is our little Belize. "The family was kind and took great care of us. We stayed in both the tree house and cabins. Both were clean & well kept (the cabin had it’s own private bathroom with sink, shower & toilet). The rooms are made up everyday. The tree house is everything you’d want a jungle tree house to be; situated on a waterfall with two levels open to the wonderful outdoors, hammocks below and two beds above with wash up area and a ladder leading down to the river. With no electric light or cell phone service it’s a great escape from the modern world. All meals are served in the common kitchen with the family; the food is excellent!!!! All the excursions were fantastic, adventurous and informative. It was akin to camping; only with beds, running water and a personal chef. If you love the outdoors, good people and unique experiences this is the place! Oh…also, there is mud, embrace it. (To qualify, it was exceptionally rainy prior to, and during our trip.)" "Martz Farm is a truly special place! 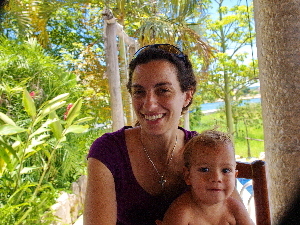 We started our time in Belize with a three-night stay here (over Christmas Eve & Day); it was an impossible experience to top. Our trek started with 24 hours of travel from our home in Colorado; reaching the farm at about 7pm. Miriam, welcomed us with a wonderful hot meal that eased all our pains and set us right for our next day of adventure. After arriving at night and getting the introductory tour with headlamps it was surreal to wake up to the sounds of birds in the heart of the jungle. Our first day (ever after known as “only day ONE” to our group) was spent hiking, boating and adventuring with Laz and Lucas. 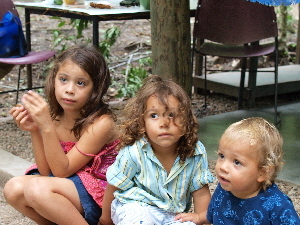 We were educated about the plants, animals, river, and forest. Laz was a knowledgeable, excellent guide with a great sense of humor. Lucas and the pups were fun to have along and provided some comic relief. We saw more than we could have ever expected on this grand first day! We spent that Christmas Eve devouring hot tamales and getting acquainted with Joe. We shared some rum and Joe shared some poetry. Day two was a full day of horseback riding through the valley and jungle to the small mouth of a cave. Joe guided us along the way and was very accommodating to our group of six with varying levels of riding experience. The small horses were sure-footed, calm and easygoing. This was a great way to observe the scenery. As with everything during this stay, the cave was a wonderful surprise. The deceivingly small mouth lead to a large chamber that spiraled downward. Joe showed us evidence of Mayan presence in the caves (the floor literally strewn with pottery fragments), and shared his insights. Every time we thought we were at the end we‘d crawl through another small opening into another vast cavern. Joe told us stories, recited poetry and made us laugh. That evening we spent with the family enjoying a delicious Christmas dinner prepared by Miriam. We spent hours in the company of the family and each other by candle light; relishing our experiences and wishing we had more time here. Miriam was a fantastic host, helping us make arrangements prior to our trip. I can’t say enough about how tasty and well prepared her food was. I wasn't sure what to expect but not this. In concert with the welcoming family, vast adventurous days, and cozy candle lit nights this was an experience that left a lasting mark. If I am ever near this place in the world again, I will make time to go here! A good energy surrounds this place and these people; we felt lucky for our short time at Martz Farm. PS. Thank you to Joe’s sisters for helping us get unstuck from the mud on our way out!